Your house keeps you nice and warm in the winter, but you find that you still have to wear thick socks or warm slippers to keep your feet warm on your cold tile floors. There is a solution. The technology of under-tile heating can help your toes stay snug and warm all winter long, no matter what surface you’re walking on. Contact ThermaWire to find out about our floor heating cables. For decades, countries across Europe—including the cold northern countries of Scandinavia—have used electric heating cables to keep their homes cozy all year round. Since 2001, we have offered this product in Canada. In 2011, we decided we were ready to expand our on-line business to make our heating products available to homeowners, contractors and builders all across Canada. We include next-day air freight in our pricing so that, no matter where you are in the country, you won’t have to wait long to experience the wonders of under-tile heating for yourself. Our goal is to make this technology, once considered an expensive extravagance, affordable to the average Canadian homeowner. For the past 14 years, we have sold, installed and serviced our products all across Canada, and we are constantly trying to find ways to make our products both more reliable and more inexpensive. We want to help you have the luxury of under-tile heating without the high price. Whether you are a homeowner looking to make your home more comfortable during the long cold season or a contractor or builder looking for innovative ways to heat your clients’ homes, floor heating cables from ThermaWire are the perfect solution. For more information, read our product descriptions below or call us at 1-888-757-2210. There’s no need to put up with frigid floors any longer. Order your floor heating cables from ThermaWire today! Thick Floor Heating Cables are well known to commercial heating contractors but not as well recognized within the residential market. Twice as thick as thin floor warming cables & mats, these cables are designed for longevity by withstanding stress during the construction process and conforming to a wide range of installation methods. Thick heating cables are the only product approved for concrete slab embedded installations such as slab on grade, basements and garages and are also the best choice for drypack installations. They are also ideal over un-reinforced wooden sub-floors when used in conjunction with metal mesh and embedded in an overpour as low as 3/8" thick. This is a preferred method for use under heated engineered hardwood and laminate flooring. Similarly, they can also be installed under natural 3/4" wood flooring when 3/8" plywood strapping is used between cable runs. Be sure to contact us for more details regarding these innovative installation methods. Thin Floor Warming Cables are the most common and popular format used today. Designed with nominal thickness in mind they are designed to be installed over a reinforced sub-floor or concrete floor, covered in a thin layer of mortar or self-leveling cement before flooring tiles, engineered flooring, laminate or vinyl is installed. Alternatively, thin floor warming cables can be installed over un-reinforced subfloors and covered with decoupling membranes before tile installation. On-centre spacing of our thin cables is between 3-5" depending on whether it is to be used as the primary heating source or only as a secondary floor warming system. Our cables are well insulated and are tougher than many competing brands available. 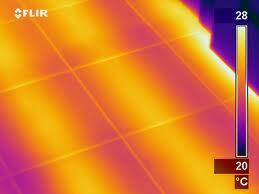 Thin Heating Mats are ideal when labour is a premium and you have a fairly rectangular area to heat. Designed with nominal thickness in mind they are designed to be installed over a reinforced sub-floor or concrete floor, covered with a thin layer of mortar or self-leveling cement before flooring tiles, engineered flooring, laminate or vinyl is installed. Alternatively, thin floor warming cables can be installed over un-reinforced subfloors and covered with decoupling membranes before tile installation. Our mats are designed for 12W/SF, which means they can serve as the primary heat source in many installations. Mats are the first choice when installing over an existing concrete floor such as in a basement or garage renovation.